The Middle East and Iran: Does Iran Want Nuclear Weapons Now? Or Just the Capability to Do So on Short Notice? Does Iran Want Nuclear Weapons Now? Or Just the Capability to Do So on Short Notice? 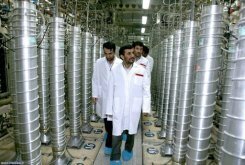 Iran has now enriched uranium to the level of 20%, which is much closer to weapons grade. Second, much of this production to the 20% level is happening at a site in the City of Fordow, near Qom. The Fordow site is buried deep under a mountain and may be immune to an aerial bombing. Finally, Iran has also set up the infrastructure to quickly expand within Fordow. From Israel's perspective, once Iran has developed its Fordow infrastructure sufficiently, any option for destroying the infrastructure by military force will disappear and Iran will essentially be immune from attack. Curiously though, on the same day the pessimistic IAEA report is out, the New York Times has an article in which US spy agencies question if Iran really has decided to build a bomb or not. According to the Times piece, US spy agencies see no evidence that Iran has re-started a program that was shut down in 2003 to develop a warhead necessary to launch a nuclear weapon. 1) Iran has truly not decided whether or not they actually want to develop a nuclear bomb or not. In this scenario, Iran wants to have the capacity to produce a full nuclear weapon, but will stop short of actually crossing the threshold. The most difficult part of constructing a nuclear weapon is enriching uranium to weapons grade, and if Iran is able to do this now AND put the infrastructure for enrichment deep underground in Fordow, than Iran will possess the ability to "break-out" and produce a full-scale nuclear weapon in short order whenever they wish. From this perspective, the Iranians may want the deterrent and intimidation factor of possessing a de-facto nuclear weapon capability, but by not crossing the threshold they hope to eventually lessen the sanctions against currently strangling their economy. 2) It is also seems possible that these two stories - the IAEA report and the US spy agencies' assessments - both coming out on the same day are not a coincidence. The US is facing increasingly intense pressure from Israel and even the Sunni Gulf states to take military action against Iran, and the comments today from the US National Security establishment that no indication yet exists that Iran has decided to cross the threshold may be a way to deflect this pressure from American allies for an attack that the US military establishment is largely opposed to.